Striking! This large, rare 1920s Art Deco square shaped cocktail ring is remarkable. Enjoy the flavor of the 1920s with this striking ring that was made in platinum. This unique ring would make a one-of-a-kind wedding ring or gorgeous cocktail ring. The main body of this ring is a perfect 1/2" square shape. At the core of this large ring is a fiery 1/2 carat old European-cut diamond (1/2 ct, SI1, J). Encircling this center diamond are eight glistening old diamonds. Triangular framed diamonds trail along both sides of this ring. Geometric shapes were an integral design motif of 1920s Art Deco Jewelry. 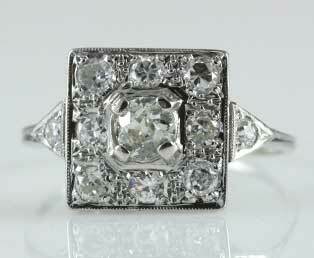 Old European-cut diamonds were generally cut between 1900 to 1920. Known not for their country of origin, but for their rounded girdle and high crown. Experience the romantic glow under candlelight. Very good condition for a 1920s ring.